The Dodge and Padre Islands dredges wrapped up on the evening of June 29th and have demobilized from the area. All construction equipment has additionally been removed from the beach and we, as a community, can now enjoy, unimpeded, our newly restored beach! A few items remain that the community will be paying attention to in the upcoming weeks. First, the Town of Duck has contractors moving along the beach from north to south to install sand fencing and vegetation to help stabilize and retain the new dune line. Second, the Town of Duck is considering amending two Town Ordinances that the Board is paying attention to. One pertains to setbacks for property owners along the beach. The second pertains to access to the beach along the newly extended dune line. As always, if any owner has questions / concerns related to these Ordinances, the Board encourages you to let us know what they are! The Liberty Island Dredge has completed the construction of the "pad" at the Widgeon Land location, and has turned it's pipes south towards the Field Research Facility. This dredge will continue moving south until the end of the project zone at the property line for the Field Research Facility. Upon completion of the southern taper zone (area between Widgeon Drive and the property line for the Field Research Facility), The dredging company will assess whether the Liberty Island will be used to work on the project area north of Widgeon Drive, versus sent south to begin work on the Southern Shores project area. The Dodge Island Dredge is currently working on construction of the "pad" at the Ocean Bay Blvd location. Once the pad is complete, the pipes at this location will be turned north. Both the Dodge Island, and Padre Island Dredges will pump sand north to the end of the project zone around Skimmer Way. Upon completion of the northern taper zone (area between Ocean Bay Blvd and Skimmer Way), the two dredges will continue to be used until all nourishment in the area of the Ocean Bay Blvd construction pad is completed. Additional work around Dianne Street, as well as any remaining work around Widgeon Drive will be scheduled around that time. Additionally, The Town of Duck has been keeping their website very well updated with graphics detailing the current project plans, including changes as they come. They can be found here on the Town's website. The project plan anticipates, depending upon the location along the nourishment area, that 40-60% of the newly created beach is expected to erode away, fill in, and generate new sand bars offshore within the initial 6-12 months after the project completes. 2017-05-25 - BEACH NOURISHMENT HAS BEGUN IN CAROLINA DUNES! The 1st hopper boat arrived last night, and they started pumping sand! Artifacts from the Beach Nourishment Project are beginning to appear on the coast line and just off the coast of the Carolina Dunes beaches. Photos courtesy of Ron Blunck. The Town of Duck recorded the Beach Nourishment Project update presented at their annual Town Retreat last week. Video is available below. A presentation was made to the Town Council at its meeting of February 15, 2017. Most of what was presented is now available for viewing at the Town's website. Attached are some of my notes from the meeting and from discussions after the meeting. Dates remain tentative, but, at this point, it is hoped that work will be complete before the end of July. As a reminder, the Town Manager will be attending our Association meeting on April 15. We hope to see you there. In the meantime, please continue to visit the Town's site (www.townofduck.com) for updates. DISCLAIMER: the attached are my notes and, as such, are subject to error. Please refer to the information on the Town's site as the authoritative source. NOTE: The construction, originally scheduled in the Town of Duck for April 1 to approximately June 1, 2017, is now projected to begin mid to late May and continue through mid to late July. The Town Manager will be present at the Carolina Dunes Association homeowners meeting planned for Saturday, April 15, 2017. That will be a great opportunity to learn the latest. Below are Tom Dorsey’s notes highlighting some points made during and after the February 15 meeting. DESIGN. The “design beach” includes the beach that we see, as well as beach that is submerged. Within 18 months of completion, a portion of the visible beach will be beneath the water. That is intended, in part, to push back the point at which waves break and begin to erode the beach. The dune will be built-up to a height of approximately 20 feet above sea level and will be approximately 20 feet wide. (See illustrations in various presentations on the Town’s site.) Vegetation and sand fencing will be added immediately to help hold the sand in place.  Because of erosion, many of the current staircases extend beyond the area permitted by Town ordinance, and this may become an issue.  The contractor is requiring a “hold harmless” agreement from each staircase owner because stairs may be damaged and partially or completely buried during the construction process. PROCESS. Sand will be dredged from an offshore “borrow site” and loaded onto a ship. The sand will then be delivered to one of two offshore pumping stations in Duck where it will be pumped to a line that will run north and south on the beach.  That line will be around three feet in diameter and can only be crossed at certain intervals where sand will be placed to allow safe passage.  Construction will be 24x7, in other words, 24 hours a day, 7 days a week. There will be noise and vibration around the area of the beach where work is being completed.  At any given time, 700 to 1,000 feet of beach will be CLOSED. There will be a lifeguard stationed at either end of the work area, and the barriers of the “closed” area will be moved several times a day as work progresses.  On a good day – in an area where a minimum amount of sand is required, when the weather is good, and when all equipment is working – they may complete 500 feet of beach nourishment. Realistically, the average will be in the 50 to 150-feet range. ADDITIONAL DETAILS. Access to the beach will be allowed as soon as construction barriers are moved past stairways – although stairways should be in place (old or new) to help protect the dune. We do not know if work will progress from south to north or from north to south. The contractor will not complete final surveys until 30 days before work begins. That will help determine the amount of sand required in specific areas. Staging of equipment at the Army Corps of Engineers site is expected to begin in April. ALL dates remain somewhat tentative. and try to attend the annual meeting of the Carolina Dunes Association in April. The Town of Duck has released an updated schedule for the commencement of the Beach Nourishment Project. The barge intended to be used on the Town of Duck portion of the Nourishment Project is currently undergoing maintenance. This is delaying its use on a separate project that was scheduled to occur prior to the Town of Duck Beach Nourishment Project. As a result, the contractor is pushing back the date the Nourishment Project will begin from April 1, to now beginning sometime in mid to late May. Completion of the project has additionally been pushed back by an identical amount of time, now in the mid to late July time range. Full details can be found on the Town of Duck website here. Project to begin 2017-04-01 and be completed by 2017-06-01. Project scope to include rebuilding of dunes such that they are 20 feet wide and 20 feet high. Project scope to include a beach of 65-70 feet, plus an additional 130-135 feet of "Advance Fill". Project staging area will be located at the Army Corps of Engineers Field Research Facility. Once Project begins, contractor will be working 24 hours a day, 7 days a week to complete as quickly as possible. The Town, at its annual Retreat conducted on February 27-28, discussed the final phases of the beach erosion study conducted by Coastal Planning & Engineering. Portential funding scenarios were also discussed. Notes from the meeting can be found in the "Documents" section on the "Project Plan" page. The first phase of this project, which is the 'data gathering' phase, will be completed by the staff at the Army Pier and will be presented to the Town Council at its annual council Retreat on Febrary 15-16. The two final phases, which are a 'data modelling' phase and a 'identify alternatives' phase have not yet begun. The two final phases are projected to cost more than planned in the budget for the Town's current fiscal year, so these two phases will extend into the next fiscal year for the Town. As a reminder, the final phase of the Town's project ends with identifying beach repair or nourishment alternatives. The project does not include any actual repair or nourishment work. There would have to be a subsequent project planned and funded for that. Carolina Dunes is approximately one mile north of the Army Pier. In July, a picture was posted on this website that was taken from the Pier. It demonstrated a very thin beach in Carolina Dunes. Thanks to Mother Nature, the width of the beach may have improved, although the tide condition was not known in either picture. Nevertheless, it appears the beach may have normalized some and may now be wider along the stretch of beach that parallels Buffell Head. That would be good news. Hurricane Irene passed directly over the Outer Banks in August and we have captured some videos shot during and immediately after the storm. ​Click here to view pictures taken by NCDOT. We have added a section of the wensite specifically dedicated to erosion concerns in Carolina Dunes. Please bookmark this page and return requently to pick up additional news and information! 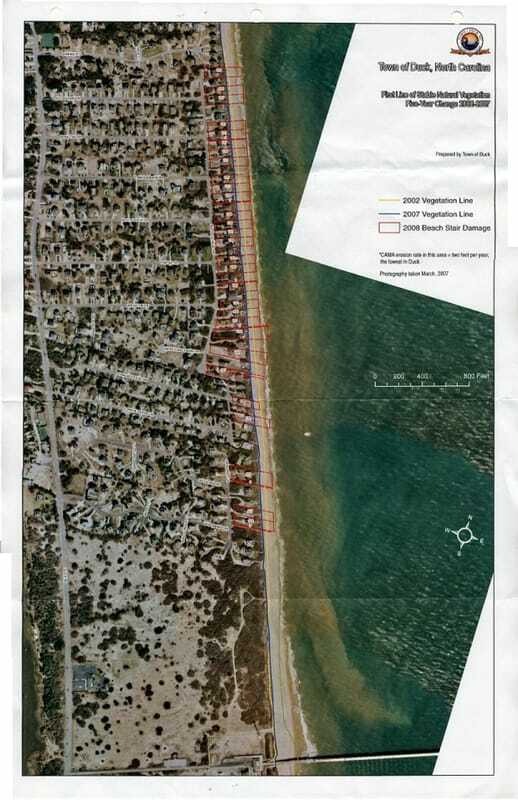 The Association conducted a community converence call on July 20th to review recent erosion issues on the northern half of the Carolina Dunes beaches. Carolina Dunes is approximately one mile north of the Army Pier. Note the area of beach that is very thin. This area roughly corresponds to Carolina Dunes. 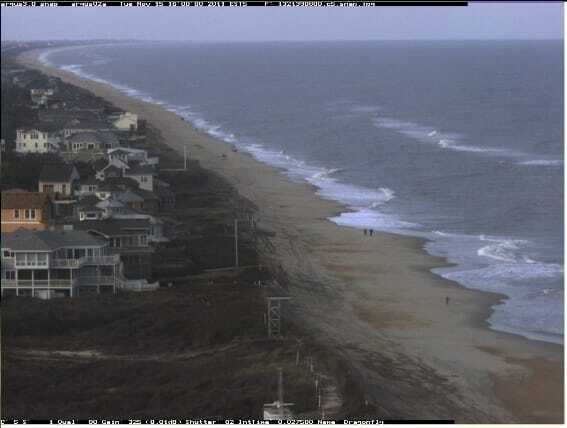 The erosion is severe and runs roughly from the middle ocean access walkway (at the end of Canvasback Dr) to the northern Carolina Dunes boundary. There's almost no beach left in the erosion area. Most private steps in the erosion area have been damaged and have been closed (ie, yellow ribbon placed at the top of the steps) by the Town. All vacationing owners/guests/renters, especially in the northern half of Carolina Dunes, have been adversely impacted. All must walk south to the middle or southern community walkways to get to the beach. Both of these access points are currently usable. As a result of all of this, the beaches in the southern area are now quite crowded. I suspect some vacationing guests/renters will complain about inconvenience(s) when they check out. Owners (in conjunction with your rental management company) may want to consider some customer accommodation discount to settle severe complaints and to encourage renters to return to your place in the future. Here's a link to additional pictures taken a couple of days ago. They were taken walking from the southern community walkway to the northern Carolina Dunes boundary. Click here to view pictures. -There have been occasional severe summer erosion events in the past. For example, Sandlerling experienced a similar erosion event several years ago. Mother nature does tend to balance the beach and can off-set erosion over time. -All damaged steps should be repaired when possible, and all owners should do what they can to prevent people from using the damaged steps until they are repaired. -Town permits to repair steps can be issued quickly to avoid repair delays. -Owners may want to consider trucking in sand to shore up the ocean side of their individual dune, and the Town is willing to work with management at the Army Pier to see if they might allow, on a one-time basis, beach access for sand equipment to bring sand in to facilitate this. However, NC state law only allows beach fill projects between Nov 15th and May 1st, so nothing could be done on this until next November. ---Probably hiring staff from the Army Pier to study and gather data on erosion and on the ocean floor in Duck. ---Hiring a company to develop/modify computer models that would use the data gathered by staff at the Army Pier to project future erosion trends in Duck. ---Hiring a company to develop erosion mitigation projects specific to projected future erosion in Duck. ---Funding (which is likely to be expensive) and execution of mitigation projects would be separate and require new initiatives. -Repair the northern community access walkway so it is usable. A repair vendor has already been contacted. -Continue to work with and communicate with the Town and the Army Pier on erosion issues. -Conduct a community conference call, if owners (particularly ocean front owners) would like to have one to discuss erosion issues and explore other ideas on individual erosion mitigation. Please reply to this email if you would like to participate in a conference call on this. ​The Town of Duck recognizes the importance of the beaches to the overall community, and they are now planning to investigate erosion control alternatives. The Town conducted a public meeting on March 23rd. The next step involves allocating money to formally identify and investigate erosion control alternatives. The Town Council will discuss this during upcoming council meetings. Click here to download the March 23rd presentation slides in PDF format. Click here to download a spreadsheet with potential negative financial impacts associated with several eroision scenarios. The bottom line is, ocean front properties account for over 27 percent of the property values in Duck, and many ocean front properties are already at risk or will be at risk within 10-30 years. Click here to download a Duck master map that segments the Town beaches into six segments. Click here to download the 1st series of maps. These maps present historical shoreline data. Click here to download the 2nd series of maps. These maps present short term shoreline data. Click here to download the 3rd series of maps. These maps demonstrate possible impact of low level of future eroison. Click here to download the 4th series of maps. These maps demonstrate possible impact of medium level of future eroison. Click here to download the 5th series of maps. These maps demonstrate possible impact of high level of future erosion. 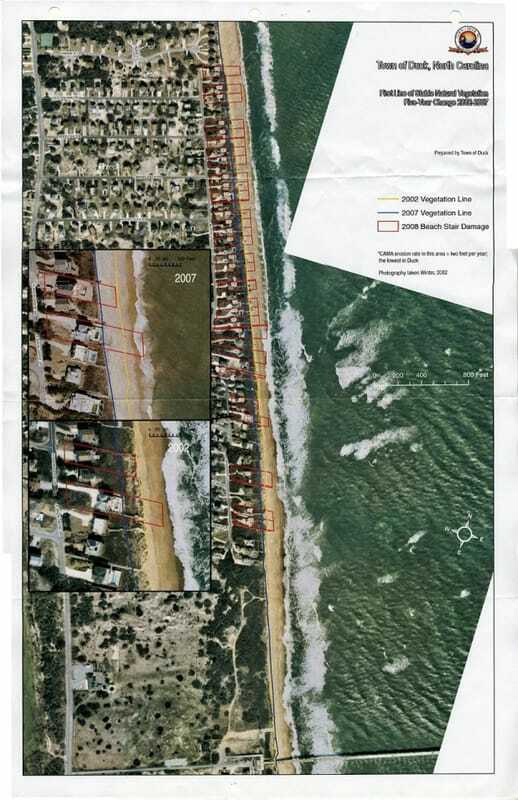 Click here to download a map of Duck's main erosion hot spot, which is in Carolina Dunes. Ocean front homes in Carolina Dunes are already at high risk due to eroison. This will be a discussion topic at the Association annual meeting on April 23rd, and the Association will work with Town officials as the Town investigates erosion control alternatives. ​The Town of Duck Town Council is considering an ordinance to prohibit the use of sandbags to protect oceanfront structures from erosion. The Town Council will hold a public hearing at 7 pm on January 5, 2011 at the Town of Duck Administrative offices. As part of the public outreach associated with this hearing, the Town has a fact sheet regarding sandbags and is sending a draft copy of the ordinance to all oceanfront property owners. These items are also available on the Town's website (www.townofduck.com/publicnotices.htm). Property owner comments regarding this matter are welcome and encouraged. Town staff reports will be available on Town website approximately five days in advance of the hearing. ​Researchers from the US Army Pier and the State of North Carolina have been studying beach erosion and have estimated the location of the dune line in Carolina Dunes for five different periods of time, 1925-1946, 1970-1988, 1996, 1997 and 2007. These dune lines are represented as five colored lines on an arial map. ​The Association contacted Spencer Rogers in an attempt to find an individual who may be able to provide some level of assistance regarding beach erosion to Carolina Dunes owners. For more than 30 years, Spencer has helped private property owners, builders, designers, and governmental agencies to develop hurricane-resistant construction methods, understand shoreline erosion alternatives and implement marine construction techniques. He serves on the faculty at the University of North Carolina at Wilmington’s Center for Marine Science, and as adjunct faculty in the department of engineering at North Carolina State University. Spencer has also co-authored and edited the latest edition of the FEMA Coastal Construction Manual, and co-authored The Dune Book, a guidebook on dune species, planning, and best management practices along developed shorelines. His research has been published in numerous scholarly journals, including the Journal of the American Shore and Beach Preservation Association, and the Journal of Marine Education. He also is a regular speaker at conferences about coastal engineering and hazards, including the annual Solutions to Coastal Disasters. Dr Jesse McNinch, from the US Army Pier in Duck, has been researching beach erosion on the Outer Banks for many years. He has agreed to join us at the CDA annual membership meeting on April 11th at 2 PM to discuss causes and effects of erosion. Dr McNinch has investigated shoreline behavior (erosional hotspots) and its relationship to underlying geology. Exposure of non-sandy substrates in the surf zone may lead to changes in nearshore bar behavior and, ultimately, elevated beach erosion and accretion at specific locations. He has been researching the role underlying geology plays in sediment distribution across the nearshore, bar development and migration, and shoreline response to storms in order to predict long-term beach behavior and improve shoreline management. Some of his projects include examination of physical and sedimentary processes on cape-associated shoals and a conceptual model for the development of cuspate forelands as well as small-scale sedimentary processes (e.g. scour, burial) around artifacts. His research approach often involves field observations, coupled with a modeling component, to challenge or test hypotheses. His training and expertise lie in observational techniques such as current and wave measurements, remote sensing, and surface and sub-bottom mapping. Dr McNinch provided us with two informative articles that he has published in the Journal of Marine Geology that describe beach erosion, particularly in the Kitty Hawk area. 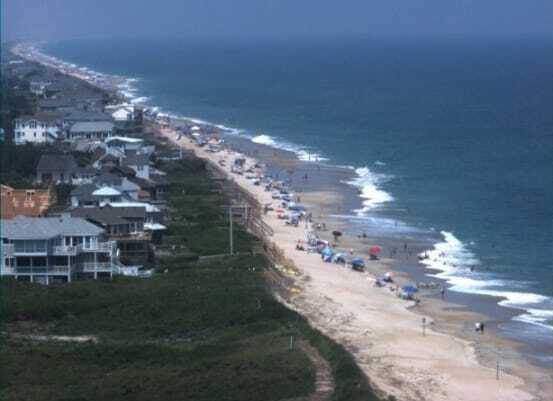 The erosion issues at play in Kitty Hawk and the general erosion concepts in these two articles also apply to erosion that is occuring in Carolina Dunes. According to the Town of Duck, an Army researcher recently doing sand/soil samples north of the Army pier inadvertently discovered sediment believed to be from an ancient river along the Carolina Dunes beaches. At this point, the researcher thinks that about 4,000 years ago (before the OBX barrier islands existed) there was a a river that flowed from the NC mainland and emptied into the ocean here. As a result, the sediment on the ocean floor in this location is different from normal ocean sediment, and some of the sediment has mounded perpendicular to the beach rather than parallel to it. At this point, the researcher thinks this may be the cause for larger-than-usual ocean waves in Carolina Dunes, which is what has then led to more beach erosion. As an historical perspective, the normal average long-term beach erosion is around 2 feet per year. In Carolina Dunes, the average is now up to 3 feet per year. The researcher has also discovered two larger ancient river basins that flowed into the ocean in the Kill Devil Hills and South Nags Head areas. Both of these areas have also had higher-than-average erosion levels in recent years.